The Act of Killing has just been nominated for an Academy Award. Congrats to Joshua Oppenheimer and the entire crew. I am reposting the following message that came to me from Joshua Oppenheimer, director of The Act of Killing. I write about the film for Guernica here. Oppenheimer notes this additional information in reference to the initial hesitation the star of his documentary, Anwar Congo, expressed about being associated with the film. I have not changed any part of Oppenheimer’s original message. In fact, Anwar only once made the claim that he was making a love story called “Arsan and Aminah”. He said it at a Pancasila Youth press conference that leaders of Pancasila Youth organised shortly after the film premiered at Toronto, before the film was available to Indonesian audiences, and before he saw it. (Indonesians saw a trailer put on line by Toronto Film Festival, and that generated a lot of media interest.) It was covered by some Indonesian papers before the journalists had a chance to see the film, when they felt a need to produce stories – ideally scandalous ones – about this “hot topic”. My sense is that he was anxious about Pancasila Youth’s reaction, and said this so that they would not blame him for making the film, recruiting the Pancasila Youth leaders to make the film, and bringing disgrace on the organization. He said the thing about Arsan and Aminah while flanked by powerful paramilitary leaders. In fact, the film was never called Arsan and Aminah. During the third year of the five-years of shooting, the boss of the newspaper (who says “one wink from me and they’re dead”) wrote a script for the scenes dramatizing Anwar’s bad dreams. The newspaper boss entitled these scenes, Arsan and Aminah. In this sense, Arsan and Aminah was a vehicle within my documentary film. (It did take on a life of its own when Indonesian state television decorated their talk show set with Arsan and Aminah posters – Ibrahim Sinik, the newspaper boss, advised them on what should be covered in the talk show, so I’m pretty sure this was his idea – in the complete, unedited talk show, they introduce the newspaper boss as the writer of the film, and he boastfully talks about his “script”, “Arsan and Aminah”…) In fact, Anwar, Herman, and the other characters have always known that Arsan and Aminah was never the title of a real film. As it says at the beginning of the film, Anwar and Herman and the others always knew they were only making scenes for my film, and were never making a film of their own. The point is, they knew from the start that the scenes only ever existed for my film, and there was never a film called Arsan and Aminah. And as I said, he only mentioned this before he saw the film, and right after the Toronto Film Festival. At that time, Anwar was surprised to find himself the center of so much media attention in Indonesia. But when I screened the film for Anwar, he was not angry. On the contrary, he was deeply moved, and said to me, “Josh, it’s a very honest film. It shows my story, and my feelings, honestly. I will always remain loyal to our film.” Who knows whether Anwar will really stay “loyal” to the film. He may be pressured by Pancasila Youth to reject the film – although so far that has not happened. If he does reject the film, I would not blame him. He has already done a great deal: breaking the silence by acknowledging (at least in his body) what everybody already knew, but that nobody dared to say: that the mass killings were wrong. And he does this by, very bravely in my view, showing the world the consequences of the act of killing on one human being and on an entire society. After Anwar decided to explore through the filmmaking his own brokenness, his own trauma, his own pain, he stopped asking when the film would be ready. This happened midway through the production, when he started to suggest we go deeper into his bad dreams. As I finished editing, I told him it was almost complete, but he didn’t seem to want to see it. I then told him it would be having its premiere in Telluride and Toronto. I reminded him what’s in the film, and why it would not be appropriate for him to come to Toronto. (He saw almost all of the important scenes while making the film, but of course it would be different for him to see the complete film.) I asked him if he wanted to see the film, and he said no, that it would be too hard for him. 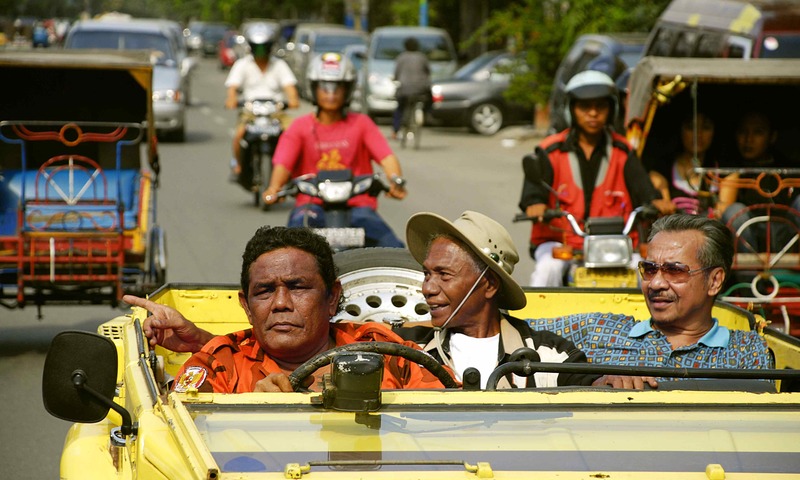 When the Toronto Film Festival put a trailer online, the film became a big story in Indonesia, and Anwar found himself at the center of a media storm. He finally asked to see the film. I explained to him that it would no longer be safe for me to travel to Indonesia to screen the film for him, but that I would arrange a screening. A journalist I knew working for Al Jazeera English offered to help arrange the screening, and I suggested that, if it was alright with Anwar, she might interview him afterwards. Anwar agreed to this plan, and on 1 November 2012, Anwar watch the film in Jakarta. He saw it in a hotel room on a large TV, and I spoke to him before and afterwards by skype. He told me that he was afraid human rights people might see the film and come after him. I told him that they already had seen the film, and nobody was going to come after him. He was surprised, and asked what they thought of it. I explained that they don’t hate him. They hate what he did, perhaps, but not him as a human being. In fact, they feel, generally, that he was brave to show the killing so honestly, and to show that killing is something human beings do, and it’s awful, and we have to understand it, and learn from it, and they feel grateful to him for having the courage to show this. I told him that, if anything, by the end of the film, viewers feel empathy for him. I explained that in fact people feel so much empathy for him that if he chose now to switch sides, the human rights community would welcome him. I told him clearly that I don’t expect him to, and don’t really care one way or the other whether he does, but that that’s how little they hate him after seeing the film. We have been in touch regularly – every 10 days or so – ever since. We care a great deal about each other. I think we always will. And finally, I feel it is my responsibility to be sure that Anwar is safe, and isn’t attacked by Pancasila Youth. He knows to be in touch if he receives any threats or sign of pressure. Herman (who also loves the film) checks in on Anwar regularly, too. We are prepared to re-locate Anwar temporarily, or provide him with legal support if he is sued. Luckily, however, Pancasila Youth has so far blamed me for the film, and has remained supportive of Anwar. I think respect for elders in the organization is somehow too important for them to jeopardize by attacking Anwar for the film – and it’s much simpler just to blame me. This entry was posted in Asia, Blog and tagged 1965-66 anti-communist purge, Anwar Congo, Indonesia, Oppenheimer, SBY, The Act of Killing by Caroline M Cooper. Bookmark the permalink.